The Yellowstone River is the longest undammed river in the lower 48 states. It starts in the Yellowstone Park and winds its way through Paradise Valley (Livingston, MT) before making a 600 mile journey to the Missouri River. The mighty Yellowstone is longest undammed river in the lower 48 states, and the heart-blood of the entire region. Explored in 1806 by William Clark on the return voyage of the Lewis and Clark expedition, it was a transportation artery for the Native Americans and early settlers. Since the 1860s it has provided vital irrigation to the region. 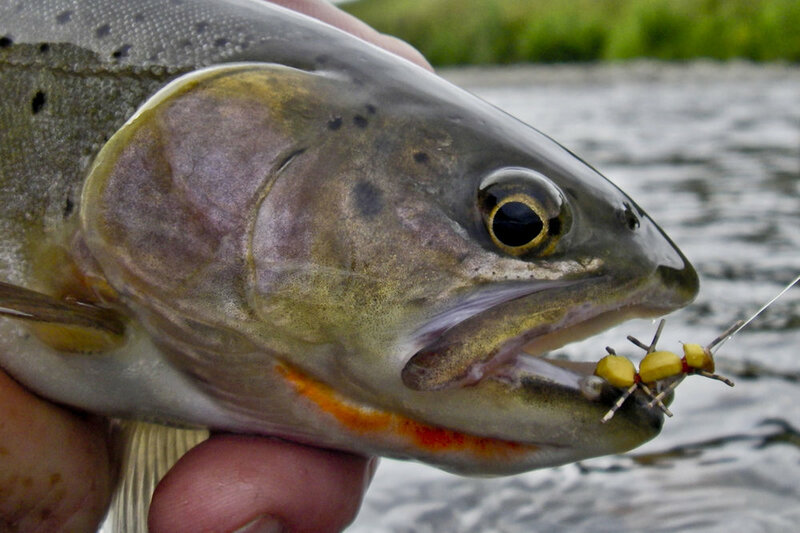 Flowing for over 600 miles, the Yellowstone River is an incredible fishery that offers the fly fishing angler a tremendous abundance of fishing adventures. From a classic Montana float fishing trip, to hiking deep into the interior of Yellowstone National Park’s backcountry, the Yellowstone is the archetype fly fishing experience. This part of the Yellowstone River can be broken further into two separate sections: The wide, insect infested, flat water of the Stone from its outlet at Yellowstone Lake to its 308 foot drop over the Lower Falls; and the rugged and challenging to reach canyon stretches that extend from the falls to the northern border of the Park. Matching the hatch and stalking some of the largest specimens of Native Yellowstone Cutthroat is what the water around Buffalo Ford and LeHardy Rapids is all about. In contrast, the long hike into the Grand Canyon of the Yellowstone will yield fast and furious action for Cutties that average 12-14 inches that blast a high riding attractor pattern. We primarily float just the “upper” section of the Yellowstone River from McConnell to Joe Brown, a beautiful and fun float that has a variety of water types from long flats, to rapids and pocket water. This stretch is loaded with mid-size Cutthroat, a few Rainbows and the occasional large Brown trout, and can produce heavy hatches that get all the fish in this section looking towards the surface. Winding its way out from the rugged canyons of Yellowstone Park, the Yellowstone as it enters Montana flows through one of the most aptly named places in the world, Paradise Valley. The Canyon stretches of the Yellowstone River are accessed via two trails. Both are steep and long, but are a fun day trip from the Firehole Ranch. The first trail lands the angler deep into the Grand Canyon of the Yellowstone, only seven-miles from the lower falls. The other trail winds into the less known Black canyon, and can go all season without seeing an angler. The most notable aspect of the Yellowstone is the chance to catch a Native Yellowstone Cutthroat. This spectacular fish is rather fond of rising to dry flies. Along with great hatches and abundant terrestrials, Yellowstone Cutties love those flies that are created with foam and rubber. Don’t miss your chance to fly fish a western tradition!